Like everyone else, I’ll be glued to the US election results tonight. I think everyone in the world will be watching this election and I’m hoping that Obama gets to be president. My fingers and toes are crossed! It’s so exciting and so nerve-wracking at the same time. So for snacking during these butterfly-tingling times, may I suggest something quick and delicious? 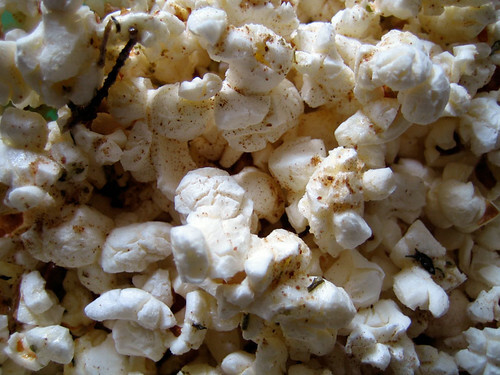 A little herbed popcorn made with some herbes de Provence, smashed garlic and some really good butter will keep you on alert and ready to rejoice. Of course, a sprinkling of kosher salt will also make everything go down a little easier. In a small pot, heat up over medium heat butter, olive oil, garlic and herbs until everything is melted and smells good. Using your favorite popcorn method (mine is air popping), pop your corn into a very large bowl. Pour herb n’ butter mixture over top and reserve garlic for a later use. Toss until everything is nice and distributed. Season with salt if necessary and toss again. Guild the lily with a bit of Parmesan cheese grated on top. Ahh, I wish you could vote! I was at our precinct all day–people in their 80’s were voting for the first time! We had to do a few curbside ballots for people who couldn’t even walk, but were so excited to vote. mmm, I have been having a popcorn craving lately and this looks perfect! Did you actually use real garlic? I would think that garlic granules or garlic powder would be the preferred choice for easier sprinkling, no? I’m not watching the US elections on TV but my husband is. I just call to him from the upstairs floor and ask him what’s happening every hour or so. I’m watching John McCain concede right now, and I’ve got to say, that popcorn sounds delicious! I had popcorn too tonight- but mine was in the microwave so it doesn’t really count. But it’s 5.30 am here I don’t think I can be trusted with proper cooking. Maybe I’ll make some “Celebration” popcorn tonight!! Sounds great! My husband will be ALL OVER this one, he’s always looking for savoury ways to enjoy his popcorn. it's definitely savory & fabulous, veggiegirl! megan, well, it all worked out in the end! hooray!! bijoux, i did use real garlic and it infused the butter with a lovely garlic flavour. i think the taste of the fresh garlic would win hands down over granules. katybelle, he did have a good speech and the popcorn was perfect alongside the election results. hooray! jabba, i hope he enjoys it. i love my popcorn like this! Never thought to use french herbs on popcorn. Sounds perfect to me. I must try it. I once tried the garlic infusion with curry in it, it was quite good over popcorn, if you have a strange cravings as do I.
Oh my! Now that the election is over, this is a great celebration snack too!! sound wonderful! i usually pop mine with oil + creole seasoning, which i recommend. dawn, i’ve never tried a curry on popcorn. could be good! trupeach, i love using my hot air popper but i can see popping it in spices would be divine. i love my popper, eatme! 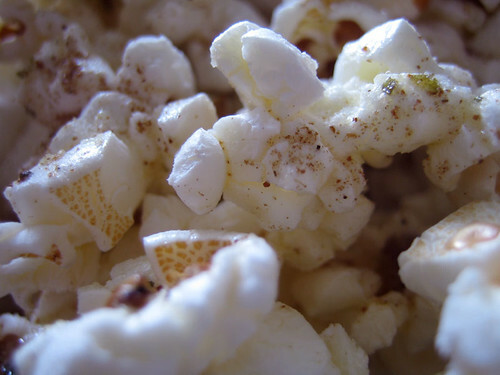 I adore spiced popcorn. This version sounds delectable.